March, April, May were packed! So we’ve been cranking along for the past 2 months. Putting in all kinds of polish and tweaks. Lots of playtesting and feedback. We’re happy to say that our vertical slice build is complete. Hurray!! Certainly, we plan further iterations, polish, and development. For the past month, we have had respected game developers, friends, and family playtest the build and give feedback. That as well as our own feedback has improved the controls and feedback for the player by leaps and bounds. So what’s the feedback? Do they like it? Thankfully, the feedback has been overwhelmingly positive. 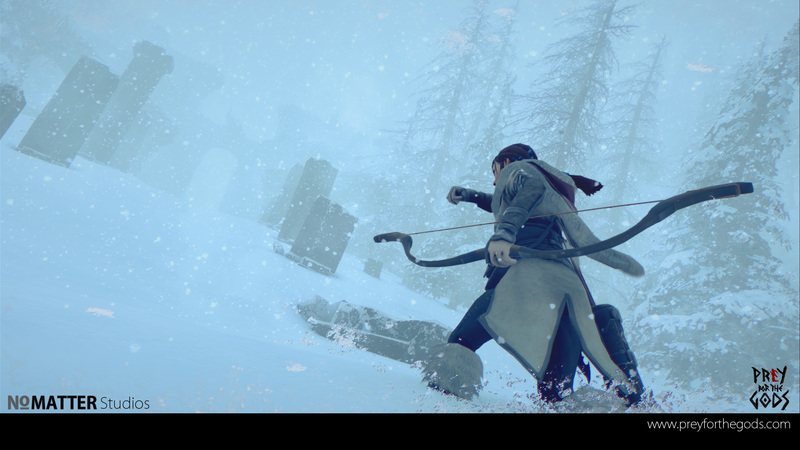 They love the snow, the combat they enjoy, and overall the playthroughs were solid. The feedback we noticed the most from playthroughs was typical first time understandings (ie: What button do I push to climb?) The most misunderstood feature was the stamina. Which initially we showed as the players screen getting darker from the corners, with the player’s breath getting heavier/louder and the character getting slower until finally blacking out the screen. A few players thought it was night time, or didn’t notice it until they ran out of stamina. We were a little surprised and tweaked the values. Most players figured out that it was stamina on their own, and when we told them the others they immediately understood it. For the sake of a demo, we opted to also go one step further and add a stamina icon that presents itself when the player begins to use stamina. We also added icons for all status types (hunger, exhaustion, warmth, health) These icons are currently positioned in the bottom right (see picture above) and appear when the player stops to idle. They fade out when the player is running, climbing, and in combat. We recently stubbed in a very muted contextual UI that is something we feel is really necessary for a demo/1st time play through. It’s really subtle and only appears the first time the player would need/want to see it. Yes, that’s a gamepad icon, we have one for mouse/keyboard too! However, while all these things are currently in game we’re considering removing them in the final product or at the very least offering an option to play without them as we prefer to play with as little to no UI as possible. As an example, playing without a bow/arrow reticle is incredibly exhilarating as it is immersing. In these situations it’s a matter of adding more feedback for the player as status UI tends to be a simplification. Another update is to our climb controls. Originally, we had a button for climb, a button for pull up, and a button for let go. As our tech has improved, we’ve been able to streamline this down to a more simple ‘action’ button like most modern games. Currently, we have it setup to auto-pull up when you reach a ledge. This feels great and expected when using a gamepad. We’re going to continue to tune them but we’ve found for mouse/keyboard the update also feels solid too. Seriously, there’s got to be more! - Chien has been heads down refining and working on our climbing tech. Hammering out the bugs and making it look/feel solid. 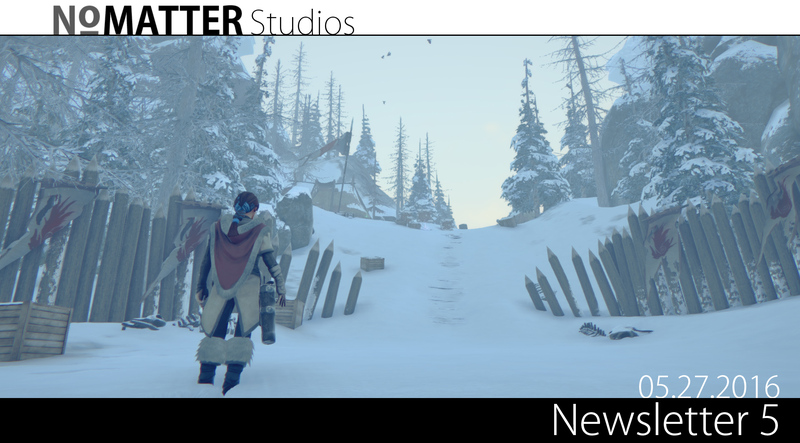 - Tim has implemented a number of adjustments to make the camera feel incredibly natural and cinematic when you play. We received a ton of compliments on this! - It’s also playable with mouse/keyboard or gamepad. - Reworked player cloth, more flappy. - We got a full set of news sounds from Skewsound. What’s with showing 5 seconds of combat on Twitter/Facebook!? Why so quiet? Yes, we know it wasn’t much. We’ve been very focused on our vertical slice, and our next large reveal. This will coincide with a much larger announcement this summer. Once that happens, we expect to show more work in progress updates. In case you missed it, we posted the link below. 5 seconds of Prey for the Gods WITH SOUND! We’ve begun work on the second boss. It was prototyped about 3 months ago and sat idle as we worked out the kinks on the vertical slice. This boss and the next boss will be non-bipedal. This is a big deal as we’ll be dealt with a bunch of new animation, AI, and gameplay hurdles. Even in it’s current state it’s very exciting and when ready we’ll show something worthy of your time. With the vertical slice complete, we’re setting our sights on the rest of the year. As we’ve mentioned before, this summer will be very busy for us as we have a lot planned in the coming months. What are these “things”? It’s still too early for us to announce anything firm but for the rest of 2016, we look to have our roadmap completed and be prepared for full production that will depend on your support. This’ll be the last time we show the Vertical Slice because...it’s done! So do we! Find an article about us? Or want us to answer some Q/A? Feel free to follow us on Twitter and Facebook. Now that we’re full time it’s a bit easier for us to respond. Brian and Tim are now on Twitter! They like to post more development tidbits.